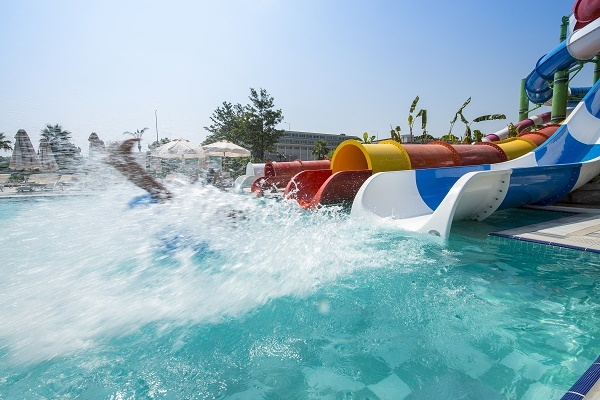 Are you wondering what some 2019 swimming pool upgrade trends are coming this summer? Do you want to upgrade, update or renovate your swimming pool or outdoor living space before summer and its triple digit temperatures settle into Arizona? If that’s the case, talk with your swimming pool service contractors from Express Pool Care about trendy items for your pool project. Here are three items to consider this year. In pool items like a grotto, rock waterfall or sunshelves. These items, either separately or in conjuction with one another give yoru pool an eyecatching new wow! factor — especially a rock waterfall. Sunshelves allow you to be in the pool, not fully submerged, and gives you a custom seating area. A grotto, if you have a rock waterfall installed, can be a source of privacy and solitude behind the cascading curtain of water from the waterfall. Beach entries are stunning, but you need to have the yard space to accommodate it. If you want a swimming pool that doesn’t have stairs or a ladder, a beach entry is the way to go. A beach entry is also the ideal egress into the pool if you have mobility issues. Swim up features such as a swim-up spa or a swim-up bar allow you to go from the main swimming pool area to the spa or to a swim-up bar without having to leave the comfort of the water. A swim-up spa is also a way for a pool owner to keep the spa section of the pool opened even if the pool itself has been closed for the season. There are many items that trend when it comes to swimming pool design and renovation. You certainly don’t want to make your pool design so trendy that you grow tired of looking at it, but breathing new life into your pool with an upgrade or two might be the way to go.